Bicarbonate of soda also called baking soda. Butter use salted or unsalted butter. Cachous small, round cake-decorating sweets available in silver, gold and various colors. Also called dragees. Chocolate hazelnut spread also known as Nutella. Cocoa powder also known as unsweetened cocoa. Cornflour also known as cornstarch. Available made from corn or wheat. Cream to make soft, smooth and creamy by mixing with a spoon or by beating with a mixer. Usually applies to butter and sugar. Cream cheese commonly known as Philadelphia or Philly. It is a soft cow-milk cheese. Dissolve mix a dry ingredient with liquid until combined. Dust to sprinkle or coat lightly with flour or icing sugar. Eggs I use large chicken eggs weighing 60g. Flour - Cornflour also known as cornstarch. - Plain also known as all-purpose. 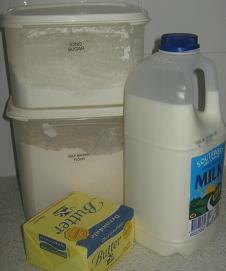 - Self-raising all purpose plain or wholemeal flour with baking powder and salt added. It can be made at home by sifting flour with baking powder in the proportion of 1 cup flour to 2 teaspoons baking powder. Fold in a gentle, careful combining of a light or delicate mixture with a heavier mixture, using a metal spoon. Food colouring vegetable based substance available in liquid, paste or gel form. Fruit mince also called mince meat. It is a sweet mixture of dried fruits, sugar, nuts and flavourings. Jam also called preserve, conserve or jelly. Melt to heat until liquified. Milk I use full-cream homogenised milk, unless otherwise stated. Poppy seeds small, dried, bluish-grey seeds of the poppy plant, with a crunchy texture and nutty flavour. Sugar - Brown a very soft, fine granulated sugar retaining molasses for its characteristic colour and flavour. - Caster also known as superfine or finely granulated sugar. - Icing or pure icing also known as confectioners' sugar or powdered sugar. Violet Crumble a honeycomb bar coated in milk chocolate.